Start by grasping a TRX rope, or something stationary in front of you. Swing your opposite arm behind you, opening up your torso wide. 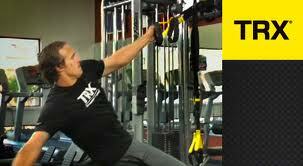 Bring that arm back toward the TRX rope. Support your body weight by using your back (lats muscle), and biceps. The Aaron Rodgers Workout and the Drew Brees Workout both use the Power Pull. Todd Durkin’s job is to make sure these NFL quarterbacks have an emphasis on joint strength and flexibility. This is something that all quarterbacks, and any aspiring NFL player, need to think about. The Power Pull is a good way to work your back and biceps. Use 30 seconds rest between exercises. Interested? To learn more about Todd Durkin’s training programs, get his book: Impact Body Plan: Build New Muscle, Flatten Your Belly & Get Your Mind Right! (Amazon). It illustrates the methods he uses to get all the NFL athletes–who flock to him in the off-season–healthy, and in NFL shape. Know anyone who can benefit from the Power Pull Exercise?